– but probably for very different reasons. Foxes were introduced to Australia in the mid 19th century and have done incalculable damage since then to Australia’s native wildlife and farm stock including poultry. Foxes have become pests even in urban areas. Their exceptional, climbing, digging and jumping skills combined with their innate intelligence make them an adversary that needs to be taken seriously by any chicken lover. Foxes are not fussy eaters and love all breeds of chickens from Astralorps to Orpingtons, Rhode Island Reds to Longhorns, and Silkies to Wyandottes so you need to be as wily as a fox to protect your flock. How Do I Make My Chicken Fence Fox Proof? Your first line of defence in making your chicken run fox proof is fox proof fencing around the perimeter. 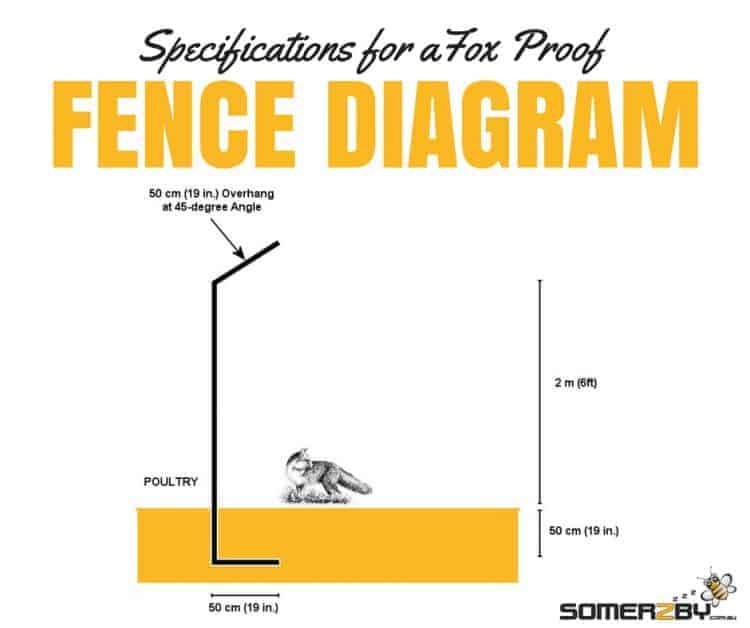 Fox proof fence heights need to be considerably higher than 900mm because foxes can easily jump a 900mm fence. To be safe you probably need to make your fence 1800mm high. You should also add an outwardly curving top to the fence. Choose your wire carefully. 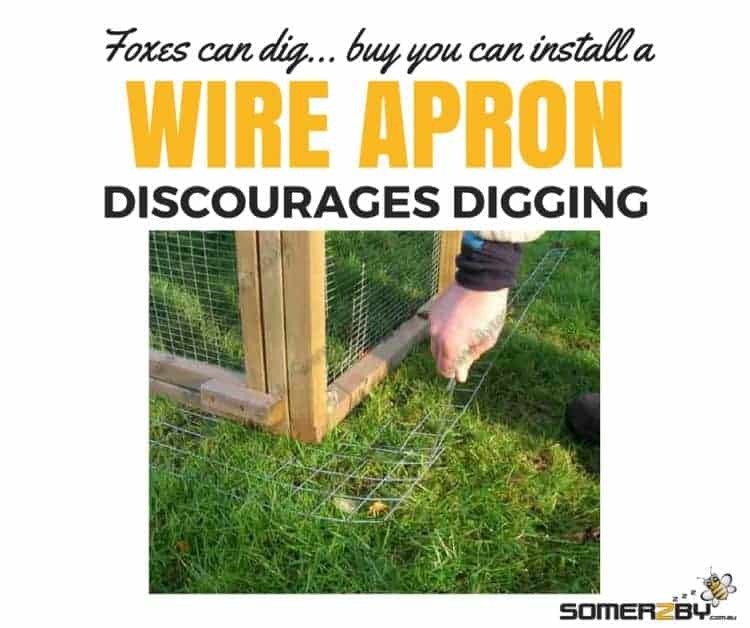 Fox proof chicken wire netting needs to be 0.9mm in diameter or thicker, as foxes will chew through lightweight wire fences. The mesh apertures sizes should be no larger than 80mm to prevent foxes climbing through the fence. You may need to add reinforcing where wire netting panels are joined to prevent Mr (or Mrs) Fox pushing through any gaps. Foxes are great climbers too so consider adding some protection to your fence posts to make it harder for them. Steel posts are more difficult for foxes to climb than timber. Electric fencing can be a useful addition but electric fencing on its own will do nothing to deter a determined fox. You can get reasonably-priced solar powered units that will easily power a few wires around the top of your fence. Do I Need To Fox Proof The Gates? Like any thief, a fox will try the door first. Essentially, gates need to be built to the same specifications as the rest of the fence. Gates and latches also need your attention. Foxes are clever enough to push open simple gate latches and it’s always a good idea to have two types of latches including a self-closing mechanism to prevent any chance of inadvertently leaving the gate unlatched. Yes, foxes will dig to get into your chicken coop or run so you need to extend your fence some 450mm under the soil. Alternatively you can spread a wire apron out from the fence line to discourage foxes from digging. Live trapping may work but foxes are very wary and trapping doesn’t necessarily prevent a fox gaining access to your chickens. In addition, the sheer numbers of foxes in any given area is frequently very high so for every fox you trap there will be others waiting to pounce. Shooting is prohibited in urban areas and poisons are strictly controlled. The risk of unintended poisoning victims including children and pets makes it a potentially very dangerous. In any case, the use of poisons such as 1080 requires a licence. Trapping, shooting or poisoning may reduce the number of foxes in your area but these tools won’t necessarily protect your chickens, as foxes from other areas will quickly move in to take their place. How Else Can I Protect My Chickens? Keeping a guard dog can be effective but it’s no use letting the dog sleep inside the house at night. And a determined fox may still have a go at your chickens despite the presence of your dog. Some people have had success using various types of repellents including motion triggered lights. Foxes have learned to associate lights with being hunted by humans and will often stay away. Motion triggered sprinkler systems may also work. Chemical repellents (both organic and synthetic) are used overseas with varying degrees of success but be aware that the use of some of these substances may be strictly controlled by Australian law. Keeping your compost bins covered and removing any old pet food or food scraps around the property will also help to reduce the attractive smells that draw the foxes to your backyard. It’s also a good idea to keep the backyard clear of any rubbish or objects that might give the foxes a place to hide or allow them to approach your chickens under cover. Don’t forget that foxes are excellent climbers and they might be able to use overhanging trees to bypass your fence. If anyone who is getting chickens or have got chickens and dont know how to keep fox’s out then watch this and try to improve your chicken pen as much as you can – please beware, this video is a little disturbing. Wouldn’t It Be Easier To Just Buy A Fox Proof Chicken Coop? Yes, you can buy chicken coops that are already fox proof. The key elements of good fence design also apply to fox proof chicken coop design. 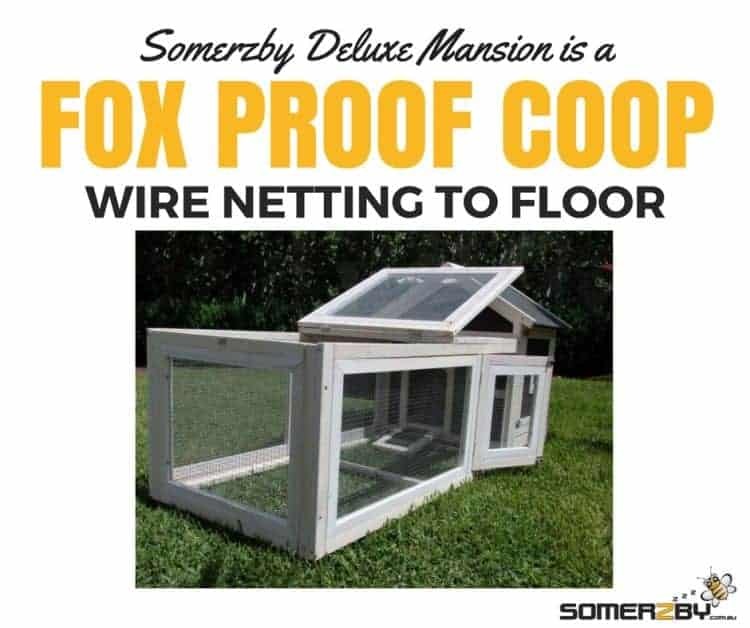 The floor and the roof of the run should have fox proof wire netting. You can use slightly bigger sized apertures on the ground to allow the chickens to scratch and forage in the soil but still prevent the fox from gaining access to the coop. If your coop doesn’t have a floor you can place it on a hard surface such as concrete, paving stones or timber but this will not allow your chickens to enjoy their normal scratching behaviours. If you find the netting of your existing coop isn’t strong enough you can easily add thicker stiffer wire mesh (available from most Hardware Stores) to the walls, roof, and floor. 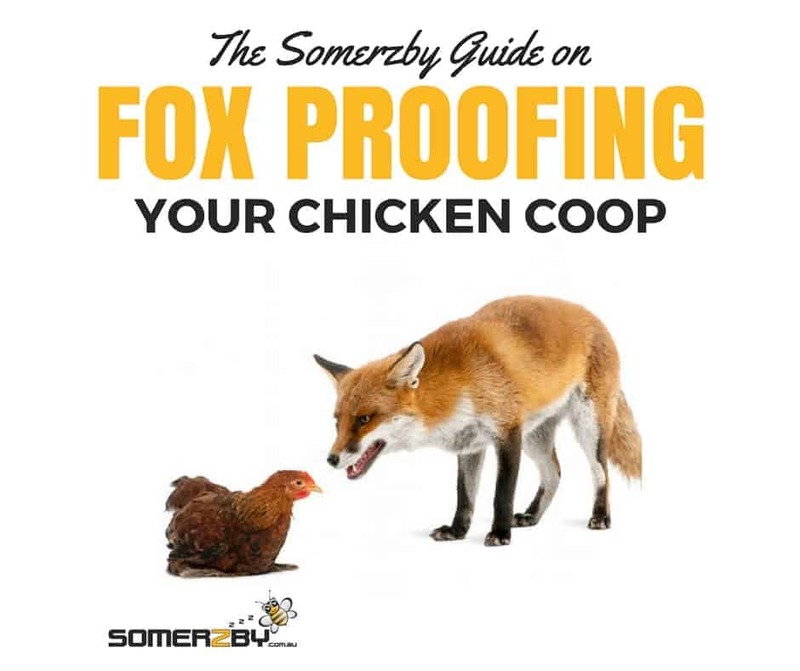 The easiest option is simply to buy a fox proof chicken coop such as the Somerzby Deluxe Mansion or Deluxe Cottage chicken coop. The Deluxe Mansion and cottage are great fox-proof chicken coops available in an easy-to-build kitset form. They feature galvanised wire chosen for its anti-corrosion longevity as well as a no fox, no nonsense toughness. You can also make any of our other coops fox proof by simply placing on a hard surface or adding wire to the ground yourself. This entry was posted in Chickens and tagged Chicken Coop, chickens, fox proof, safe, snake proof.